Cheeky Babe (2f Muscle Hill / Factor The Odds by Pegasus Spur) won at Auckland on the 15th March where she drew No.1 in the Non Tote event over 1700m and went straight to the lead, trotting beautifully in front, to go on for an excellent win, running her last 800m in 59.3 and the final 400m in 28.8 and a Mile Rate of 2:06.3, thus qualifying 4.9 seconds under the required time, in what was a big effort – bred by Breckon Farms Ltd and raced by the Breckon Farms – The Savvy Six Syndicate. Dina Brown (3f Mach Three / Pullover Brown by Armbro Operative) also won at Auckland on the 15th March, drawing No.6 she worked her way to the lead in the NZ Sires Stakes/Rosslands 3YO Fillies Graduette and was pressured going past the Winning Post with a round-to-go, but kept her attackers at bay and was in front turning for home and bravely held on to win by a ½ neck, with the last 800m in 56.5 and the 400m in 27.1 to now have 2 wins & 4 placings for $23,681 – bred by MW Feek, TJ Candy and GT Nolan. Cash N Flow (6g Mach Three / Karen Donna by In The Pocket) won at Menangle also on the 15th March where he started from No.8 off the Front Line and went forward to take the lead, but then handed up to take the trail with a mile to go, then turning for home he came through on the passing lane to hit the lead 150m from home and took the win by 2.7m in a Mile Rate of 1:53.9 for the 2300m and now has 14 wins & 7 placings for $207,041 – bred by Breckon Bloodstock Ltd. Crystal Sparkles (5m Rocknroll Hanover / Taylor Kate by Artsplace) won at Globe Derby Park also on the 15th March, starting from the outside, she went straight to the front and was never headed, pulling away from the field to win by 11m in a 1:56.7 Mile Rate for the 1800m to now have 15 wins & 11 placings for $75,354 – bred by RA & JV Yarndley. 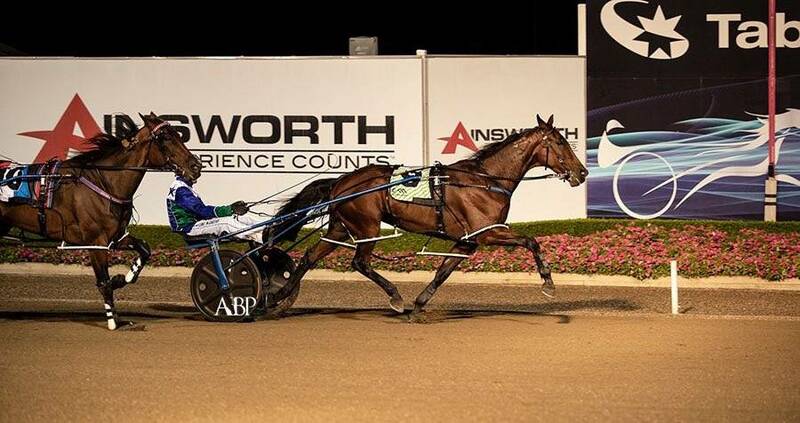 Placed horses this week were Bita Banta 3rd and Shanocon 3rd both at Newcastle, Itsokbeingbetter 3rd at Wanganui, Times Stride 2nd at Menangle, Neighlor 2nd and Just Rockon Bye 3rd both at Gloucester Park, Stress Factor 2nd at Boort, Stylish Trend 3rd at Launceston. Lerado 2nd at Miami Valley Raceway.